Mixmate, designed for both growers and retailers, can simply be loaded onto a tender truck for a job. It can run by one staff person (changing out jugs, mini-bulks, and water) and any Android device. 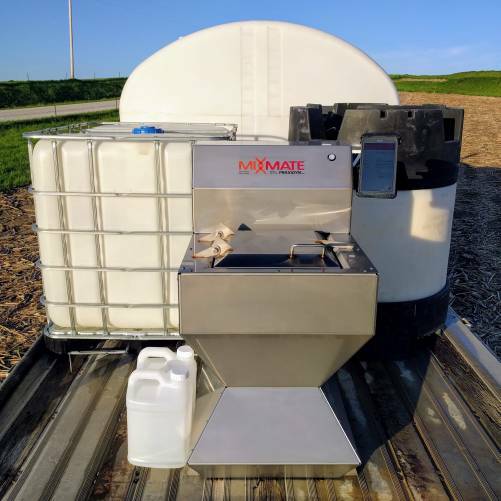 More than two decades ago, Iowa grower Doug Applegate wished for a “little portable chemical blending system” that could easily travel to fields — and software that would simplify batch calculations. Seven years ago he began developing his own unit, and with the aid of his ag engineer sons Brent and Luke, has now launched Praxidyn, a company to market it as well as an app to run the system. The Mixmate app communicates with an operation’s office via its own cloud-based network called Intersect. It can calculate amounts of needed blend components (plus factor in important in-field variables such as weed type, weed size, and wind speed), then direct the user for the mixing process. Applegate is currently in talks with several industry software companies to allow Mixmate to interface with their retail management systems. He will be working on the API connections through the summer and by fall should have some of those in place. “This is really going to streamline mixing operations because if retailers can send work orders from those systems into ours, then all the operators have to do is the mixing,” he explains. And Mixmate’s Android platform is great for users. Software updates can be pushed up through the Google Play Store; all a customer has to do is accept them. In May, Applegate set up a system for a large Kansas grower who is looking to tailor chemical applications so they can be optimized in the field. He will export any mixing data from Mixmate — and any field application data — to Granular where it can be merged for an accurate picture of spray events. Heacox is a Contributing Editor for the CropLife Media Group, which includes CropLife and CropLife IRON magazines, and the PrecisionAg Special Reports. See all author stories here.